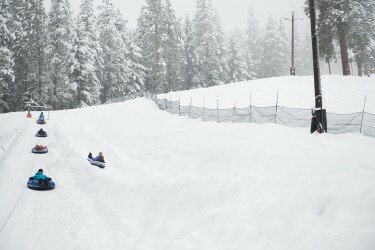 Snow tubing is fun for the whole family. 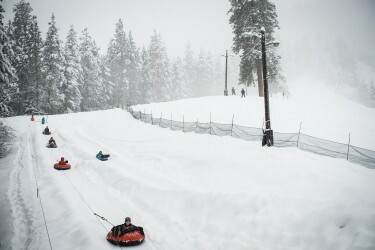 Sit on our provided tube as the rope tow pulls you to the top and then sends you gliding down the 100-foot hill. This is perfect for group or family activities. No skill is required. Don't forget to enjoy our snacks and hot chocolate in the Ski Hill Lodge! For more general inquiries email info@skileavenworth.com. Tubes are provided with the purchase of your ticket. Tickets are not available for purchase ahead of time and must be purchased when you arrive at Ski Hill ticket booth. 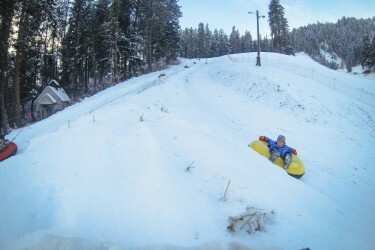 The tubing hill is available for private rental. Email info@skileavenworth.com for more info about private parties. 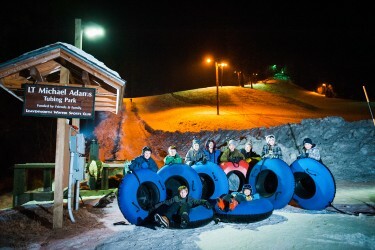 The tubing park is named in honor of LT Michael Adams, a graduate from Westpoint, who was killed in March 2004 while serving in Iraq. The tube lift was purchased in large part with a donation from the Adams family and friends. Please print, review and sign the waiver before tubing in the park. View here. Please read the following to answer questions you may have about the Leavenworth Ski Hill, Lt. Michael Adams Tubing Park. 1) How old does my child have to be to go tubing? a. 8 years old is a good threshold, however kids as young as 4 years old have enjoyed the experience. Regardless of age, all tubers must be able to ride safely, independently and follow verbal and/or written instruction. 2) Can my child sit in my lap or can I hold my child? a. No. All Tubers must ride safely and independently. 3) How will I know if I or my child will like it? a. We offer a 1-Time-Free trial ride prior to purchasing a ticket. b. A Liability Waiver must be signed to get a 1-Time-Free trial. a. All Tubers pay the same posted price. The price is the same regardless of age. b. No Family Tickets or Group discounts. c. Active Military receive a discount. 5) How long can I tube? a. A Tubing Ticket is good for 6 runs through out the day your pass was purchased on. 6) Can I purchase Tubing Tickets on-line? 7) Do I need to or can I make a reservation? 8) When does the Session Start? 9) How does it work? 10) Do I need to bring my own tube? a. No. 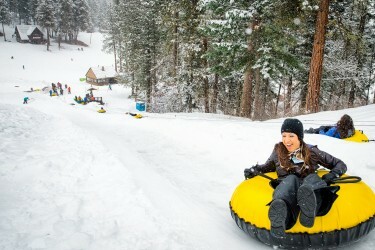 The tube is provided with your Tubing Ticket and is specific to the Tube Lift. 11) Do I need any special clothing? a. Dress accordingly to the weather. b. Recommend a hat, gloves, jacket and winter footwear. 12) How do I find Leavenworth Ski Hill? b. In Leavenworth on HWY 2, turn onto Ski Hill Drive at the Wells Fargo Bank intersection. Stay on Ski Hill Drive approximately 1.5 miles.